Hello! My name is King but you may call me "Your Majesty". 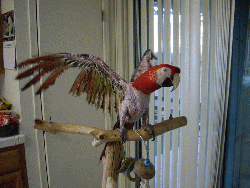 I am a noble Scarlet macaw who has seen some tough times. My cockatoo buddy and I were confiscated by a humane society due to neglectful conditions in our former home. Now thanks to Mickaboo we are safe, clean, eating well, and already loved by our new foster parents. Not much is known about me but the important things can be discovered over time. I seem to like my foster mom but more reserved with my foster dad. I am becoming more confident and less apt to fear bite. Now that I am more relaxed I am using my vocabulary and it is impressive for a macaw. I have become a chow hound making up for lost time before Mickaboo. NOTE: King has just begun a behavior modification program to reduce aggression, fear of hands, and to teach Step Up, among other requests. This is a long-term program, which will require a knowledgeable adopter to continue on with King. To learn more about positive reinforcement please read the material on this website: www.thegabrielfoundation.org/html/friedman.htm. Mickaboo also offers an Advanced Bird Behavior class to train foster parents and adopters to solve behavior problems in companion birds. Check out our website www.Mickaboo.org, click on Event to locate the next scheduled class. UPDATE 10/29/09 from King`s foster Dad: King has made huge strides in the past few months. His training program has done wonders. He now willingly steps-up on a stick, takes treats gently from my fingers, does several simple tricks and even lets me give him scritches and preen his pin feathers. Of course this is all on his terms, he still has the tendency to try to bite and can be down right grouchy at times. He has grown back many of his feathers. He still has plucking issues with his chest and legs, but he is looking is so much better. He even has his yellow wing stripe back! We still have a ways to go, but King is a much happier and healthier macaw. UPDATE: 4/30/12 King has a new home at the macaw sanctuary in Washington. He is going with Lucie the greenwing and we all hope they will make friends and live happily ever after! !